Know all about balloons and ballooning and fancy a career change? This could be for you but you’ll need to be quick! The post advertised is for a Flight Standards Officer (Balloons) based in Gatwick. The position is permanent and they’ll bung the successful applicant around £55,000pa, depending on skills and relevant experience. With interviews on 12th February 2018. To apply go to https://www.caacareers.com/jobs/flight-standards-officer-balloons and click on the "Apply" button. We get loads of hits on the events page so after a bit of a marathon session we have managed to update the thing. We have concentrated more on the UK Meets as these are what we get asked about most but will add more European and overseas ones in due course once Barry has recovered. As usual the northern reaches of the country have a fantastic selection of meets going which are always open to all. We do and try to update the site regularily and if something drastic happens like they cancel Yorkshire for August we’ll put a News Update up. Sad news that on 5th January a landing accident involving a Ride Balloon from Luxur resulted in the death of one passenger and injuries to 15 others, two serious. It was reported that 20 passengers were on board when the accident, during the landing, occurred, the passenger who died being from South Africa. It has been suggested that a change in the wind direction and strength took it into much more rugged area was responsible for the accident. AFP news agency reported that the Luxor governor Mahmoud Badr confirmed Friday's accident and assured reporters that he was checking on the well-being of passengers at a local hospital. Apart from Egyptian tourists the passengers included a number of foreign nationals from South Africa, Argentina, Brazil, France and Australian. The UK Foreign Office said that no British citizens were involved. The Egyptian Civil Aviation Authority said, in a statement, that 21 other balloon trips carrying more than 400 tourists had all landed safely. In 2016 balloon flights were temporarily halted in the region after more than 20 people were injured in a similar accident. Ryanair luggage ‘rules’ change and beware check-in rules! Beware if you are flying Ryanair as their luggage/baggage allowances have changed again. As usual their terms are not quite as clear as they could be however they have issued a bit of guide that arrived after we’d booked a flight! Its is actually quite, more or less straightforward. If, like us, you opt for the cheapest ticket with no frills, ‘Non-Priority’, you are only permitted to bring 1 small personal bag on board (max 35cm x 20cm x 20cm) that must fit under the seat in front of you. Your second bigger 10kg cabin bag (max 55cm x 40cm x 20cm) will be tagged at the boarding gate and put into the hold free of charge and can be collected at the baggage carousel on arrival. If you have chosen ‘Priority & 2 Cabin Bags’ (previously Priority Boarding), Flexi Plus, Plus or Family Plus will be permitted to bring 2 bags into the cabin: 1 x 10kg cabin bag (max 55cm x 40cm x 20cm) and 1 small personal bag (max 35cm x 20cm x 20cm). Now here’s the thing, if you have purchased airport shopping, or duty free, you may take that in addition to the cabin bag allowance (max 35cm x 20cm x 20cm) if you hold a non-priority ticket. If you are travelling with infants there is no cabin bag allowance for the infant (aged 8 days to 23 months) travelling on an adult's lap, however, a baby bag up to 5kg may be carried by the accompanying adult in addition to their own cabin bag allowance. The check-in bag allowance has increased from 15kg to 20kg for all bags, still below the industry norm of 23kg and the standard check-in bag fee has been cut from €/£35 to €/£25 for this service. They are pretty strict on this so beware, we saw some outsize handbags getting a telling off. Best you wear all your going away clothes and don a coat with poachers’ pockets. Just to make life more tricky, if you are booking a trip at the Ryanair basic level then you cannot check-in (free online) any earlier than four days before the trip. This means that if you book a return trip with more than three days between departure and return you will not necessarily be able to check-in online to get your outbound ticket as it is date sensitive to the return date. To avoid the problem book the outward and return flights separately. Just had Barry Newman’s hopper in for its annual. It’s an Cameron H-34 over a Skyhopper bottom end with a Worthy cylinder. 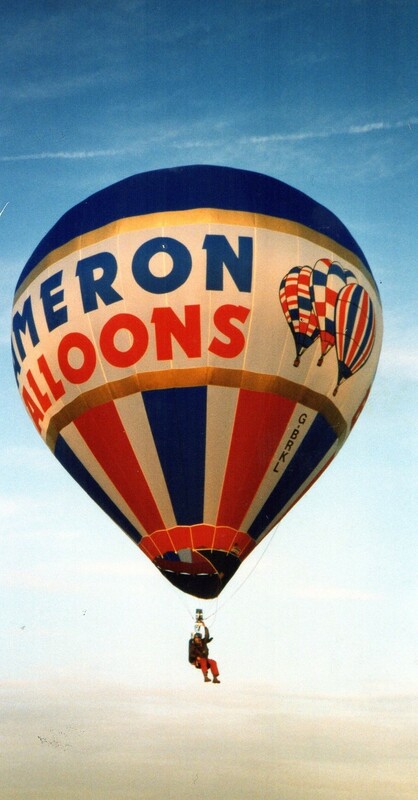 Now, as Barry has been busy building his own fleet of balloons his old ’34 is now for sale. Its registered as G-BRKL c/n2075 and was built in 1989 in Cameron Demonstrator colours. It has 74 hours, just been inspected, the ARC and inspection expire 21/01/2019. Granted it is a tad smelly with some mildew but it isn’t porous and passed a grab test in all colours. One new double flying wire was fitted. This hopper hasn’t flown since its last inspection and really does need flying! The Worthington cylinder was PPT’d last June so that is good until 2027. We reckon that at £2500.00 it’s a snip. For more details or to kick the bag contact Barry Newman at bnewman46@googlemail.com. Rumour Control reports that it is looking likely that Tim Wilkinson is thinking about running a dedicated home-built balloon meet. Nothing official yet, but with Sackville out-building the manufacturers then it would be nice to see a pile of home-made jobbies, and maybe the odd Annex II balloon, sharing the same field. The builders are expected to spend time comparing thread length and bobbin sizes whilst quaff home-made beer and wine. Sounds good to us! The next Instructor training days will be held on Saturday 17 March 2018 and Saturday 19 May 2018 both at Wellesbourne Airfield. Well worth attending whether you are an instructor, budding instructor or just helping train future balloon pilots. Instructor training days are open to all pilots who give instruction not just for Instructors. Please book a place through BBAC Shop https://www.bbac.org/shop/Item/p_idays_1803 or for more information contact Dave Court at training@bbac.org. The first 25 places are free. Yippeeee. Just back from our periodic Fire & First Aid course with Justin Lane at Bristol Safety where time was spent discussing all things safety related under the CAP611 syllabus. The next advertised Bristol Safety course is on Friday 9th March. What is always good about these events is the chance to practise putting out a roaring burner and carrying out resuscitation techniques. One topic discussed was the carrying of water and burn dressings in the balloon. Most people carry a small bottle of water but how about upping the anti and carrying a litre and a half. There have been incidents where small smouldering fires have been extinguished using bottled water (much better than dry powder), it is good for those that suffer de-hydration (not as uncommon as you may think) and, of course, invaluable for cooling burns (hot or cold). Fire blankets seem to have gone out of fashion and these can be extremely effective. As part of the pre-flight check it is suggested that you not only try and find the fire extinguisher but turn it over and over a couple of times just to loosen up the powder. CPR has now gone to 30 compressions and two rescue breaths but it is now thought better to concentrate on chest compressions. 100-120 deep compressions is the trick. There are now plenty of defibrillators available throughout the country, most towns and villages have one somewhere and now an app exists to find them. They are extremely easy to use as they come with spoken instructions. Do you possess the basic skills that could save someones’ life? If not get on a course. It is mandatory for Commercial Pilots but invaluable for all pilots and crews alike. Justin tends to run his balloon-related courses from Bristol but would travel for larger groups like Balloon Clubs. Got surplus club funds? How about running a First Aid Night? St John’s Ambulance can often be persuaded to turn out or the local fire station. The next Bristol Safety Course is on Friday 9th March. For more details contact jlane@bristolsafety.co.uk, tel+44 (0)7709 460992 or check out their website www.bristolsafety.co.uk. The app are, for the AED locator is http://www.heartsafe.org.uk/AED-Locations and for assistance and help ahead and in conjunction with the emergency services go GoodSAM (Good Smartphone Activated Medics). This is the world's most advanced emergency alerting and dispatching platform. The app allows alerters to dial the emergency services, and at the same time notify nearby medically qualified responders of a medical emergency. By alerting responders of an emergency, GoodSAM connects those in need with those who have the skills to provide critical help before the emergency services arrive. Check out https://www.goodsamapp.org/ for details. Excited? Bet we were. A chance to look round the prestigious CAA Kingsway Branch. Disappointed? Not Grand Tour but a meeting in support of the implementation of their recently launched new airspace change process cunningly called ‘Airspace Design - guidance on the regulatory process for changing airspace design including community engagement requirements (CAP1616)’, whoa bit of a mouthful, no idea what it means and it’s the first we’ve heard about it. Think Gatwick is the home of the CAA? Nope this is in the smoke at their Kingsway HQ and will take the form of a ‘market-stall’ (my son) event, at which a number of CAA specialists will be available to discuss the requirements of the new process and answer any questions that you may have about it, like what is it? There will be a morning (10.00 to 13.00) and an afternoon (14.00 to 17.00) session. The event will take place in Conference Rooms 1 & 2, CAA House, 45-59 Kingsway, London, WC2B 6TE. If you would like to attend, please send an email to airspace.policy@caa.co.uk with the name and organisation (if applicable) of those attending and the session you plan to come to. Please note that they are planning to host a similar event in Manchester towards the end of February or in early March. As soon as this is confirmed they'll give us the nod no doubt. In the blind panic to get out stuff at the end of last year I'd forgotten to post this seasonal quirk. 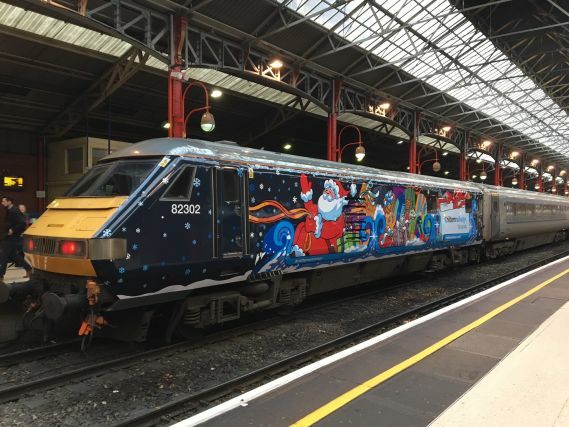 I came across this piccie of our beloved Silver Surfer all painted up as Father Christmas’s train on the Chiltern Railways website. Sadly I think this has been returned to normal but what a wheeze. Maybe the engine (Trailer Car actually) will be named Noel or something suitable! Barry has been trotting off to Bicester station with his spotters’ pad to try and clock as it thunders through at 100mph but it has been a bit of a no-show I’m afraid. Well now some many years ago I wrote a piece concerning rattling window frames of the Crittall metal variety, when BAC111’s and Britannias flew out of Luton when I was a kid. One day last year, sat having me morning coffee, we heard the sound of four-engined turboprop, clearly not that high, sounded a bit Britannia on steroids, well as luck would have it, for the briefest of seconds it appeared in a gap in the clouds. At first quick look it did look like the profile of a Britannia. Obviously that was impossible so Jane checked her ‘who’s flying what where.com’ on her phone and it turned out to be an Antonov 12 belonging to the Ukraine Air Alliance, registration UR-CAJ, entering service on 24th January 1969, it had come out of Luton and was flown by Ivan (according to Trevor). They are proper aeroplanes noted for steep approaches, noise and smoke! We checked with Pete Bish to see if it counted as a ‘spotted’ but apparently you have to see the registration. Bummer that’s another potential hobby over. According to Pete they fly in and out of Luton collecting and delivering parts for General Motors Vauxhall. Never mind, since then we check every so often to see where it is. Does get about a bit. Fast wotsits to Wednesday night, Thursday morning and the sound of an approaching high flying, droning, four engined jobbie woke me from me slumbers. Cripes that has to be the Antonov thought I falling back to sleep thinking it was all a dream. Then later that same night I heard another! Looking up Planefinder in the morning it turned out the first one was our old mate CAJ en-route from somewhere cryllic to Iceland and it had passed over at 26,000ft, just to the north probably using Bovingdon’s beacon. It landed somewhere in Ireland, probably Shannon, about one o’clock in the morning to refuel and then went on to Reykjavik arriving there about half nine local time. 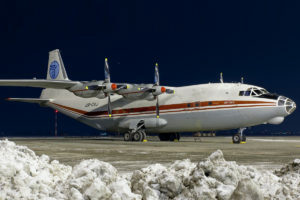 Now, quite what it was delivering to Iceland does make you wonder but that’s the mystery of these late-night, high-flying transport aircraft. Actually they fly to the States and refuel in Iceland stopping again at St Johns in Newfoundland. This is a quite regular route apparently. If you check out Ukraine Air Alliance’s website you can do virtual tours of the inside of UR-CAJ, which is a bit of a revelation. They carry a couple of spare wheels! So this year we have decided that our mission will be to make friends with the Ukranians and try to see her somewhere. You never know, we may even try and do a Bishy and blag a ride. Photo courtesy of UAA.